A 74-year-old Sattahip woman was injured when a 3-meter-long python suspected of eating 15 of her chickens bit her as she tried to scare it off. Chaowara Yiransiri was hospitalized for a bite to the arm that occurred as she took a large stick to the large snake in her Moo 3 chicken farm. The reptile, with a big chicken-shaped bulge in its belly, wasn’t moving, but it was ready to fight. Sattahip Civil Defense Volunteers have managed to capture the snake and will set it free in Khao Lame Poo Chao at Prince Chumphon Camp. The grandmother said about 15 of her birds have gone missing over the past few months. When she noticed yet another chicken missing, she went looking and found the snake under an old mattress. 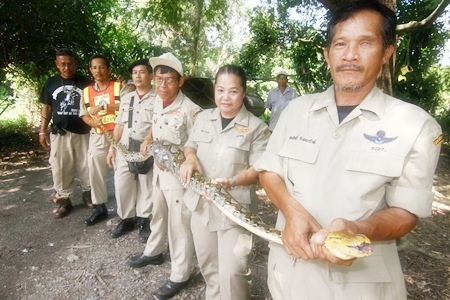 Six Sattahip Civil Defense Volunteers came to Chaowara’s rescue and, after 20 minutes, were able to rustle up the snake. They set it free in Khao Lame Poo Chao at Prince Chumphon Camp where it won’t bother anyone.